Unconditional Love. Tenderness. Devotion. Joy. Togetherness. Happiness. Comfort. Laughter. Affection. Soul Mates. Forever. These are just a few of the amazing words and feelings that describe what I share with my Mommy everyday. She adopted me four years ago this February. We are very blessed and we have a wonderful 'blended pet family' of 7 dogs and cats, most of whom have been rescues. However, as I lay here thinking on my own gifts of a great home, I am also thinking of the fact that there are so many pets sitting in a shelter of some kind or another, or living on the streets, with very little time left to experience even one of those feelings. Today, it's time for a change. It is time for us to BE the change for animals. 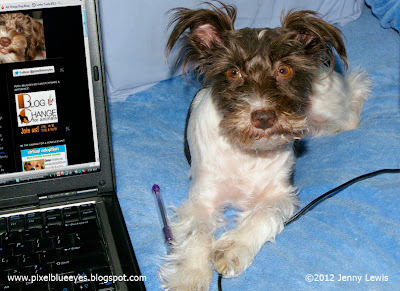 So today, I, Pixel Blue Eyes, am Blogging the Change for Animals. There are many great shelters that do everything they can to rescue and adopt out animals with no where else to go, but they need our help so much. Mommy and I have helped raise funds and collect much needed food and comfort items for local shelters in our area, but that only helps these animals for a little while. What these precious souls need more than anything is a forever home. Like what I have. I give to Mommy as much as she gives to me. It is a two way love street. Imagine how it feels to have a sweet, smiling, loving face thrilled beyond belief to see you every single time you walk through the door. Now...imagine Charlies' story below. Please read it. Think on it. And then find a way to act. I am helping 'Sharing Pet.com' promote a new kind of way to help shelter pets called 'Virtual Adoption', which you can get details for at the right of the screen. Charlie didn’t know why he was in there…he was an old guy who’d had a bad time of it lately. As he sat in his cell, the cold bars and cement floor was no comfort. He was half blind, hungry, and not sure why things had gone so bad. All he wanted was to be loved. In the last years of your life, you always think, want and expect to have a nice home, family around you and special times. Yet here was Charlie, taking in his new small dwelling, no family, no nice warm home, no more special times. Then, a woman with a kind face came in, holding something. She opened the cold metal door, telling Charlie someone had brought some stuff for him. She put a bowl of food nearby and placed down a soft looking bed on the cold cement as she coaxed him to come and try it out. Nervously, Charlie came over to her, wanting nothing more than to run out that open cell door. He reluctantly laid his old bones down on what she had laid out for him. It was soft, not scratchy like so many things he had tried to call a ‘bed’ in the past. It felt good on his old bones. Just as he began to relax a bit, she placed a warm blanket over him. What was this…some kind of cruel joke? Why was she being so nice to him? Where did this stuff come from? He took in a deep breath, closed his eyes, and waited for the dream to end. Suddenly, he smelled the warm fireplace that he used to lay by when he was young, he smelled all that wonderful cooking that wafted from the kitchen that he often snuck into to get a bite of chicken when Mom was making sandwiches, and he could almost feel all the hugs he used to get from his girl. He opened his eyes quickly and saw the woman still there with him, gently petting his head. “I know this is not home, but I hope we can make you as comfortable as possible dear boy, until we find you a new home. A forever home,” she said. Charlie realized he was smelling memories from the donated bed and blanket, memories of another that had been loved like he was…but it was more than good enough for Charlie, because for just a moment, he felt loved, comforted, and just a bit like he was home. Be the Change for a dog like Charlie and adopt a homeless pet or 'Virtually Adopt' a pet. Either way, you are making a difference. 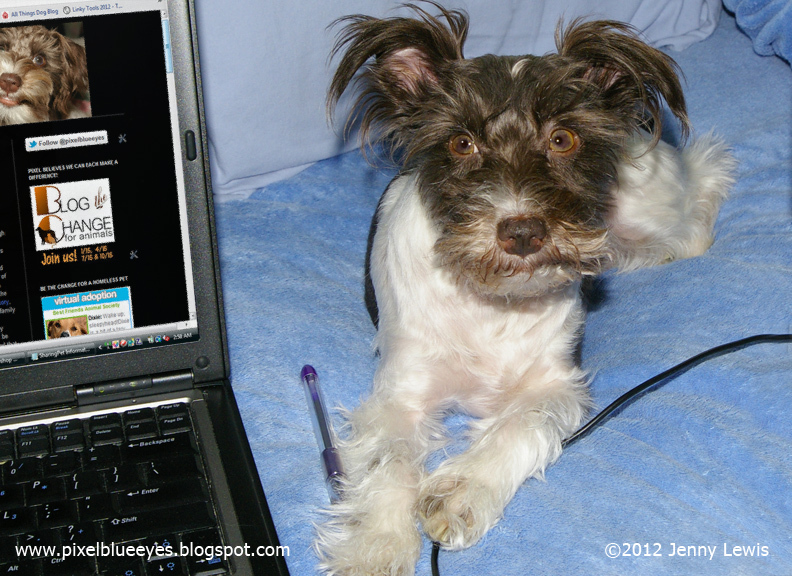 Please view the list of other pet blogs below that are supporting "Blog the Change" Day today. Visit them and see how other pups like me are finding the joy of making a difference! Thank you Pixel for sharing this today. My spaniel-mix Kelly is adopted too, and I applaud all those who adopt and foster dogs. Thank you for participating in Blog the Change Day and for sharing Charlie's story. There is something we all can do to Be The Change - whether it is adopting from a shelter, donating food, blankets or toys, making a financial donation or just sharing a story! Pixel is a lucky pup and Charlies story outlines the very reason why fostering is as important as finding a forever home. Sometimes that transition staves off depression and resulting anxious behaviors, making chances for finding a forever home even greater. Whatever commitment level folks can provide, it always makes a difference. Oh, boy...you've got me all teary-eyed here with Charlie's story. SharingPet.com is a great way to help homeless pets! Whether or not we can personally adopt or foster, we can still do something to make life a little better for these precious creatures. Here's to the day when all pets have loving homes! Thank you for making a difference, and for blogging the change for animals! Hi Kim! Thank you so much for your wonderful comments. What an amazing day it will be indeed when all pets have loving homes! I am so glad to be a part of the blog for a change community. Mommy and I are already planning our next topic for April. Take care and visit anytime my new friend. A beautiful post and this was my cause today too. I hope we both get our wish that more people make furever homes for pets in shelters and rescues! What a wonderful post, Pixel! this is my first time visiting you - thank you for your compassion. I am happy to say we participated in Blog the Change AND 4 animals from our combined sanctuaries found homes today - hooray! Hi Roberta! My mommy and I are so excited and thrilled that your efforts have resulted in four animals adopted today. Wow! I really hope they have the best forever homes ever! Mommy always says that every little soul has a voice, and it is our responsibility to either help them find it or be their voice for them. Thank you so much for sharing such fantastic good news my friend. Maxwell: Hi Pixel! *waves paws* We're so glad you stopped by our blog, we had to come over & say hello. And thank you for blogging about such an important topic. Mommy's dripping ALL over me again *sigh* but it's worth it. I was a shelter kitty too - and completely deaf (they say we're harder to adopt but I have *no* idea why). I'm so glad you & I (okay, and Allie & Faraday too) found such wonderful forever homes! Great post for Blog the Change! Thanks for commenting on my blog about shelter photography - I look forward to hearing whether you are able to do some volunteer work! So glad your Mommy rescued you, so you could take part in Blog the Change. Great post, I hope it encourages others to adopt homeless dogs!